In conjunction with this exhibit, the artists will also be doing an Artist Talk on Wednesday, March 19th at 5:30pm on the topic of: Work & Process. 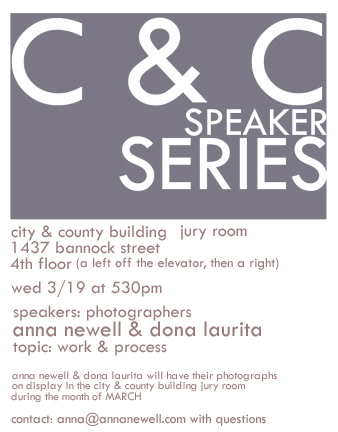 This Artist Talk is part of the Speaker Series that happens every 3rd Wednesday in the month. The Exhibitions & the Speaker Series are held at: 1437 Bannock Street, 4th floor, a left off of the elevators & then a right… Please come stop by to see the photographs M-F between 12 & 6.